60% of Golden Retrievers will die of cancer. Your dog can help change that. 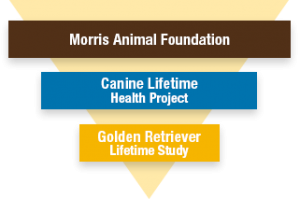 Morris Animal Foundation’s Golden Retriever Lifetime Study is the largest and longest effort ever undertaken to improve the health of dogs. Over the next 10 to 14 years, observational data collected from 3,000 Golden Retrievers will help us learn how to prevent cancer and other diseases that take the lives of dogs too soon. More than 70 million dogs live in the United States. Half of them over the age of 10 will die of cancer. In fact, cancer is the leading cause of death in dogs over the age of 2. We must stop this disease. Help us become 3,000 Goldens strong. We need canine heroes to join us in the most groundbreaking study in veterinary medical history. If you are an owner, enroll your dog today. If you are a veterinarian, encourage clients to register. If you are a breeder, help spread the word. Every dog lover will make a difference—including you. Help Morris Animal Foundation eliminate cancer in your beloved breed. Please encourage your puppy buyers to join 3,000 Golden Retriever owners who are enrolling their dogs in the most important observational study ever undertaken to improve canine health. This study will identify genetic, environmental and nutritional risk factors for cancer and other health problems that affect Golden Retrievers. Puppies from the same lines are extremely valuable. Data collected from littermates that experience different environmental factors and diets may provide unique scientific insights that could make a significant impact on the long-term health of Golden Retrievers. Your participation will improve the health of future generations of Golden Retrievers and will help create a brighter, healthier future for all dogs. Register one or two of your own dogs. If you are a breeder, tell your puppy buyers about the study’s importance to the breed and encourage them to enroll. Help club members who are breeders reach out to puppy buyers to promote the study. Spread the word about the study through club newsletters, club meetings, club websites and your personal online social networking communities. Identify club members who are veterinarians or veterinary technicians and enlist their aid to speak with club members about the study from a medical perspective.